January 23, 2019 had a serious major blowing snowstorm threat on the Winnipeg Livestock Auction date; showing clearly the sale was affected. The low delivery of only 100 sheep and goats — and the extremely low bidding from the buyers, showed that this threat was more than just serious. The bidding was even lower than the first auction of the year. The health and safety of the sheep and goats, when purchasing, was the topic. During the sheep sale the selection of rams was limited, but the buyers were not very interested. Suffolk-cross rams appeared to be highly mature, while a 150-pound Rideau-cross ram had a desirable set of horns, well curved and symmetrical. A group of 11 95-pound wool lambs, representing the market class, brought $1.82/lb. A group of 15 81-pound wool lambs, representing the feeder class, brought $1.81/lb. The lightweight lambs dominated this sale. The buyers were being cautious in the lighter lambs, due to the weather reports. Ten 74-pound Dorper-cross lambs reached a near-normal bidding standard, bringing $1.90/lb. 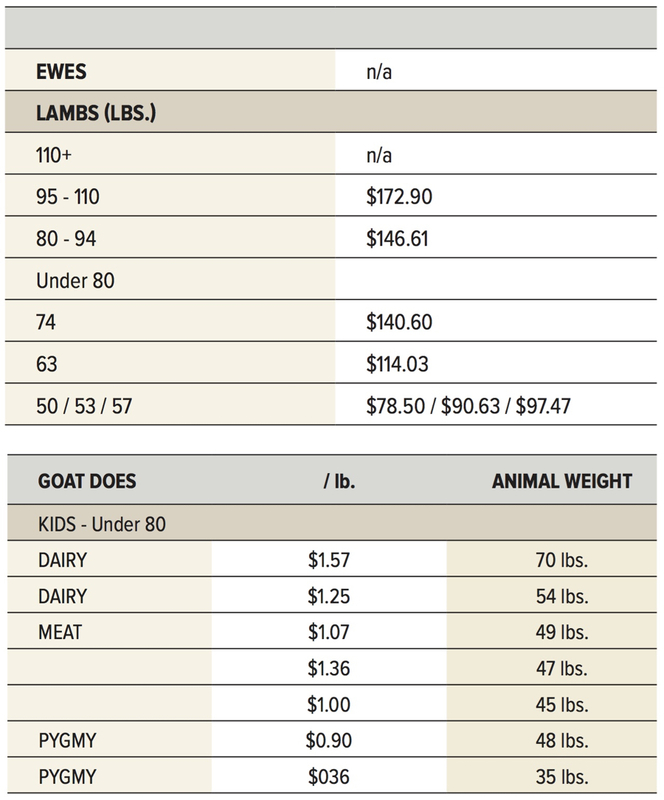 The five 63-pound wool lambs brought $1.81 per lb. Buyers had very little interest in any of the lighter lambs, whether wool or hair lambs. The two 50-pound Dorper-cross lambs brought $1.57/lb. Six 53-pound Katahdin-cross lambs brought $1.71/lb. Three 57-pound wool lambs brought $1.71/lb. Only lightweight goats were delivered for this sale. The selection of goat kids was still limited, as was at most of the auctions through the year. The bidding was clearly low, based upon numerous factors of the day and the attitudes and interest of the buyers. Ontario Stockyard Report was also affected by weather conditions. However, prices did not follow the low Winnipeg bidding, as low deliveries there caused higher price bidding.